How Much Can You Haggle Down Used Car Prices? 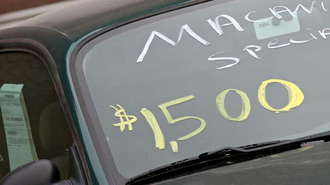 The used car price on the windshield should be treated as a starting point for negotations. Learn how to bring used car prices down to your budget. It's very important to haggle down used car prices. To negotiate, you need to do your research first. You also need to know your budget. Everyone selling a vehicle is looking to receive the highest price they can, but they also have a bottom amount they are willing to accept. There are things to do, say and think about before going into the negotiations. Before you go look at any car, figure out what you can afford. Keep in mind there is sales tax, licensing and title fees you will also need to pay. Work on your budget with the help of an online calculator. Calculate how much down payment you are willing to pay and how much of a monthly payment you can make. On the online calculator you will find this payment labeled as equated monthly installment (EMI). Find out the rates at which car loans are being offered in the market at this time. If you're planning on financing the purchase of a car with a bank or any financial institution, visit them first. They can help you determine how much you can afford, if you need to put a down payment to secure the loan and what interest rates are available. If you plan to use a trade-in, negotiate the price for the car you're buying before putting the trade-in into the negotiations. Be the first to make an offer; that offer should lower than the asked price. Go lower than you think they are willing to except, but not so low as to insult them. They will try to raise the price but you already took the offensive with the negotiations. Remember if they are not ready to deal, walk away; that is one of the best negotiating tactics you can use. If you're buying the vehicle at a dealership, do not discuss whether you are paying cash or using outside financing; if they ask, change the subject. Dealerships make commissions if you finance through them; if they know your getting outside financing they might raise the price to cover their commission loss. Plan enough time to negotiate the deal, if you get tired, frustrated or hungry during the negotiations, leave. If you stay, you will be worn down and might take a bad deal just to get out of there. Just tell them you will be back later. If they know you're tired, they will push to close the deal. Many dealerships have hidden fees such as car prep or cleaning the car before you pick it up. Tell them you're buying the car in a clean condition and they should cover those costs. Tell them you want to see all the fees in writing before you make a deal. If you want the car but need to leave, get the deal in writing. If they ask for a deposit to hold the vehicle, also get this in writing and make sure the deposit is fully refundable.